GPSSB Recruitment 2018 Notification. A screening test will be conducted for GPSSB Deputy Secretary vacancies recruitment 2018. Screening test/ Written Exam will be conducted for 150 marks. 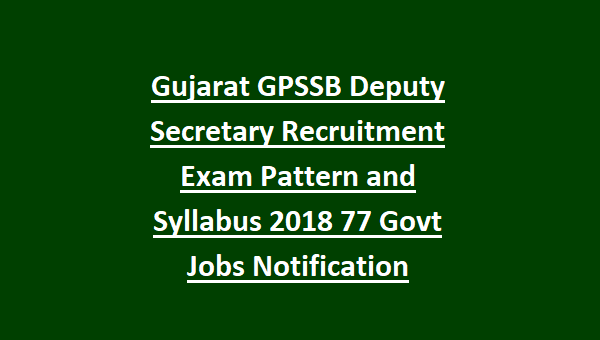 GPSSB Deputy Secretary Exam Date is Dec-2018. For applying this Deputy Secretary vacancies candidates must have completed their graduation and knowledge of Computers is required. 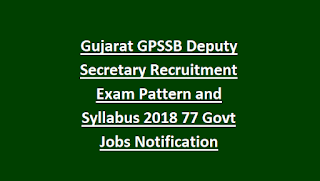 GPSSB Deputy Secretary Exam Syllabus, Examination Pattern, age limits, admit available date is updated below. There are total 77 Posts in this GPSSB Deputy Secretary jobs recruitment. As on 26-10-2018 age limits 18-35 years for this Deputy Secretary Posts. For SC, SEBC, ST male candidates upper age limit is 40 years and all categories women candidates upper age limit is 45 years. For Deputy Secretary posts Degree qualification is required..
Pay Scale : Rs.31400 /- for this DS Jobs. Candidates selection for this GPSSB Vacancies Recruitment 2018 will be based on Screening test and interview. Written Exam will be conducted for 150 Marks for this GPSSB Deputy Secretary Posts. Written exam duration is 90 minutes. Written Exam will consists of single paper only and it covers the 4 topics. Written exam will be OMR based only. 1. Gujarati Language & Grammar-35 Marks. Apply online before the closing date of 26-09-2018 for this GPSSB vacancies. GPSSB Exam Date, Admit Card release date, exam syllabus and other details are available www.ojas.gujarat.gov.in website only.